He shocked fans when he revealed he had a secret son in a Twitter post. And Anthony Joshua was enjoying some bonding time with his little boy as he hit the beach in Dubai alongside his brother's girlfriend Sam on Monday. 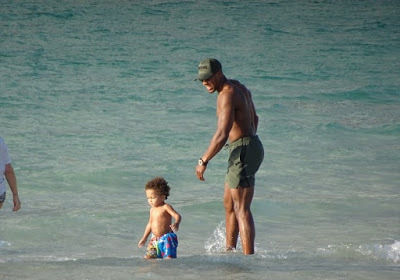 Cuddling up to his little one, the 28-year-old boxer waded into the sea with Joseph on his hip, before the group frolicked in the waters together. Showing off his musclebound physique, Anthony donned a pair of khaki swimming trunks whilst he accessorised with a baseball cap and shades. 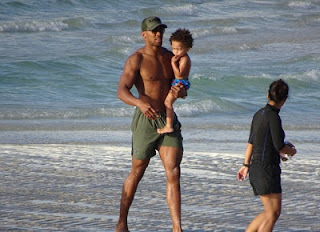 Beaming broadly, the world heavyweight champion seemed in great spirits as he ran across the shore line with his son in tow.